When my kids were young, we always made Our Favorite Sugar Cookies for Valentines Day, Halloween and Christmas. Last night, I decided to throw together a batch. 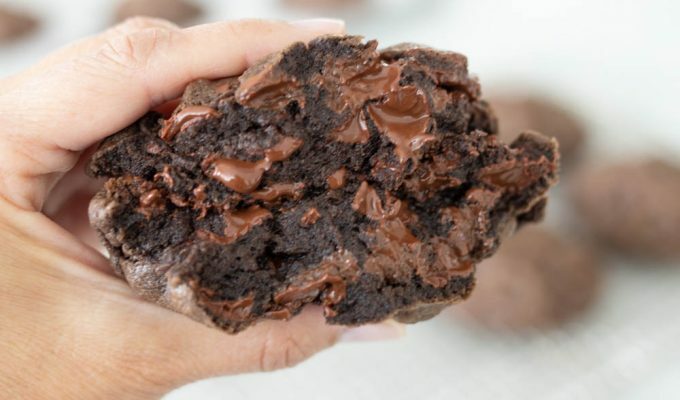 I love these because the recipe makes about 40 large cookies, enough for eating and sharing. The cookies by themselves are not very sweet. Frosting on these cookies adds just the right amount of sweet. Yum. Cream the butter, shortening and sugar together. Mix in vanilla and eggs. Beat until blended well. In a separate bowl, mix together flour, baking powder, and salt. Add flour mixture alternately with milk. Mix at low speed just until all flour and milk are mixed into the butter mixture. Do not over mix. You may refrigerate at this point, over night or up to three days before baking. Roll out on floured surface in batches about 1/4 inch thick. Cut with cookie cutters into desired shapes. Place on ungreased baking sheets about one inch apart. Bake at 350 degrees for about 12 minutes or until lightly golden on edges. -The dough will spread and puff up. Do not place too close together. If the cookie dough is refrigerated, the dough will not spread as much. Beat butter until soft. Add 3 cups of powdered sugar. Continue mixing on low. Add salt and vanilla. Add 2 more cups of the powdered sugar. Mix until smooth. Add the milk a tablespoon at a time, along with the last cup of powdered sugar. Scrape down sides of bowl, and mix until all ingredients are incorporated and smooth. Add food coloring if desired. Yields enough frosting for about four dozen cookies. – I like to color the frosting in batches, so the cookies are not all exactly the same color. To do this, mix in the food coloring at half strength. For instance; the directions to color a batch of frosting calls for 12 drops of yellow and 4 red. I used 6 yellow and 2 red, and frosted about 12 of the cookies. With the remaining frosting, I added in 3 more drops of yellow and 2 red. I frosted 15 of the cookies in this shade of orange. Then I added a few more drops and frosted the remaining cookies. If this is too complicated, just divide the frosting into bowls, and color each bowl a different shade. Or, color the whole bowl of frosting the same shade. -Also, I’m not a huge fan of using a lot of food coloring, so my frosting is a pale shade. If you like your frosting to be darker in color, you’ll have to double the amount of coloring. Si, I have used this same recipe for years for cutouts. Did we grow up with the same mother? My mom used it for years before I did. I love the softness of this cookie. It's the perfect vehicle for the frosting. Do you still prefer these over the Cutler’s cookies? Good question! I haven’t ever tried these side by side next to Cutler’s Sugar Cookies. I will have to make a batch of each sometime soon. When I do, I will let you know! So I am making my sister sugar cookies for her bday! I want to try one of yours! Would you recommend the Cutler’s recipe or these for thick soft cookies? Sorry I missed this comment earlier! Either of those recipes are wonderful. I like the Cutler’s recipe a little more than the other recipe. Making a batch this weekend as well. Happy baking! Si, do you make any adjustments for altitude? Ever since moving to NSL I haven’t found a sugar cookie recipe that works. The problem is the dough is so soft (even after refrigerating) that I can’t transfer the dough to the baking sheet. When I add flour they become tough and dry. I just made this recipe and it turned out great but I had to roll and cut them straight on the silicone baking mat (so lots of waste). Any suggestions? Thanks! I don’t make adjustments for sugar cookies. I made this recipe for Christmas, and they turned out perfectly at about 4500 feet in elevation. No idea why these aren’t working for you? You will need to add some flour to the dough when rolling out, as it is quite soft, but the added flour shouldn’t make the dough tough. Make sure the flour is at room temperature and you are using all purpose flour in the recipe. Hope this helps!